In Part One (which you can read here), I wrote about my friendship with David McKnight, beginning in the mid-60’s with high school, where he was voted “Most Likely to Succeed,” until the mid 90’s when I lost track of him. I eventually heard from friends that he was living in the Triangle, back and forth between Raleigh and Chapel Hill and Durham, homeless. 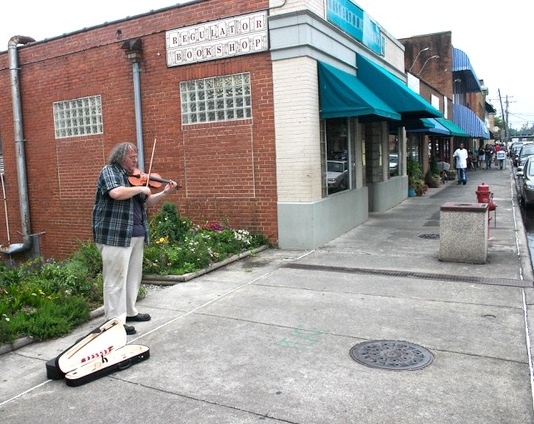 He played his violin as beautifully as ever, but now on the streets. And stories came back to me that David’s was indeed experiencing mental health challenges. In this second post, I want to continue to examine the nature of friendship, by extending the story to the middle of later years of David’s life, and by expanding the circle of his friendships. This is going to take me more space and time than I anticipated, so there will be one more post after this one. Aristotle confirms the deep value we place on friendship when he writes that no one would want to live without friends, no matter what other goods we have. He writes that friendship is love for each other, “reciprocated goodwill.” Since we love people for different kinds of reasons, we have three different kinds of friendship, based on what is useful or pleasing or good. The first two by themselves are incomplete forms of friendship, while the friendship based on what is good is the basis for a complete friendship, which does include the first two types, also. “Now those who love each other for their utility do not love each other for themselves but in virtue of some good which they get from each other.” What we love in such relationships is what is good for ourselves. We love the usefulness of the friend; we do not love the person for who he is. It’s the mutuality of this usefulness that makes it friendship. I found David to be an astoundingly genial, funny, creative and knowledgeable person. He was unique. About 2014, when I had not seen David for several years, we emailed to set up a day and time to have lunch at Dain’s, on 9th Street in Durham. David let me know he was inviting Bill Yaeger, a longtime Durham friend. Bill and I got there first, and we had a few minutes to chat. Bill told about both his friendship with David and also the challenges David presented. I saw David coming in the front door, walking slowly with a folding stool he carried so he could sit down and rest whenever necessary. His hair had become grayer, and he was heavier than I last saw him. But when he saw me he broke into that familiar inviting smile, and he came over and gave me a big hug. We sat back down in the booth, where a couple of David’s other friends had joined us, and I asked if everyone was ready to order. “I’m not that hungry,” David said, “so I’m not going to order anything.” I replied that since I was honored to be seeing David at Dain’s for the first time, I was going to buy. “Well, in that case,” he said, “I think I will get something.” And he polished off a hearty meal, joining me and the others in having a beer. As we all sat and talked, David’s personal gifts were vivid, refreshing my memory. He listened to what others had to say, responded well, and worked in several good jokes. I believe that one person at our table was German, and David at point switched seamlessly into fluent German. Then as the conversation went on, something prompted David to start talking about his trips to various towns in the United States named Charlotte, the same as our hometown. As he talked about Charlotte, Michigan, and his visit there, he began to rattle off facts about that town, its history, its old courthouse that had been turned into a museum, and conversations he’d had with residents. As he was going on, Bill Yaeger caught my eye, and smiled, and nodded as if to say, “he’s amazing, and he’s not just making this up.” Sure enough, when I got back to Charlotte, I googled the other Charlotte and found David was right on target. So it’s clear that in many ways David had many friends in the types of friendship based on his benefiting and pleasing others. And they clearly were beneficial and pleasing to him, too. The groups provided a way to earn some money, get food and drink, and to enjoy comradeship with good folks. And as I’ll write in the next post, they were a refuge for David. But were they complete friendships, in Aristotle’s sense? What does it mean that in a complete friendship we are “both unconditionally good and beneficial to each other”? Sometimes it’s helpful to carve out the boundaries of a concept by showing what is on the other side, what does not fit within the concept. For example, if we are friends and you ask me to procure heroin for you, and I do so because I want you to have what you want, procuring the heroin is not what is good or beneficial for you in the long term, for either your physical health or your developing self-control, so that is not a complete friendship. A complete friendship is based on what is good. Likewise, if I cannot control my anger and periodically erupt and hit you, again that doesn’t fit under complete friendship, and I lack an appropriate use of anger. If I hit you periodically, certainly if I do so for no reason, I’m not doing something for your good. Or, to take it one step further, we could not be complete friends with an evil person. What, I ask you, would it look like to be complete friends with Hitler? Another email focused on a “technological stranglehold” by powerful organizations, and then moved on to argue that Kinko’s was conspiring against him and the smaller colleges. The reason? Because he had tried to send an email at two different computers at a Kinko’s about a Davidson College croquet match, and the email did not go through either time! And living on the streets as he did, David and his clothes were sometimes dirty and smelly. So, David is a long way from being one party in Aristotle’s ideal of a complete friendship, in which each person is perfectly excellent and virtuous. David didn’t always keep his commitments, he could get angry irrationally (such as at Kinko’s), and perhaps didn’t have sufficient pride in his appearance and cleanliness (easy to say from someone not homeless). But perhaps the problem also lies in Aristotle’s definition of a complete friendship. One of the strengths of Aristotle’s approach to philosophy is that he bases his ideas on a process of observation and then thinking about the best way to describe and evaluate those observations. That’s how he came up with the idea of the three types of friendship. And we know and experience all three: friendships which are based primarily on mutual usefulness, or mutual pleasure, or those much rarer ones which are complete friendships. However, in asking for perfect virtue/excellence for those in a complete friendship, Aristotle has gone beyond what observation shows, and he has set too high a standard. I don’t know any perfect people, and I know for sure I am not one. Aristotle is right, I think, that the friends in a complete friendship must have some key virtues. Who could be complete friends with a truly evil person? If a person doesn’t show any loyalty to me, or at key times does not show loyalty, how could that person be my friend? And if a person breaks too many promises to me, I will no longer consider that person a complete friend. There’s no magic number about how many broken promises a friend can make, but we can make reasoned judgments about such situations. Next time I will try to capture some of the love and joy David’s friends found in him, as well as a sense of the depth and reality of David’s friendships in the next and final (I’m pretty sure) post on David. Aristotle, Nichomachean Ethics, Book 8, chapter 2, translated and notes by C.D.C. Reeve (Indianapolis: Hackett Publishing, 2014). Aristotle, Nichomachean Ethics, Book 8, chapter 2, Reeve. https://www.facebook.com/pg/CSSMusic/about/?ref=page_internal accessed August 13, 2018. Robert Smith email to Norris Frederick, August 14, 2018. Book 8, chapter 3, Reeve, emphasis added. Book 8, chapter 3, Reeve. Book 8, chapter 3? (p.139), Reeve. Reeve note to Nichomachean Ethics, p. 315. What a great way to discover Aristotle’s definition of friendship. David was a trip and I am sure he cherished his friendship with you, Norris. I get engrossed in the story and then you bring me back to the meaning of friendship. David was a fine musician. I remember when he challenged Bobby Ennis for Concert Master of the Garinger High School Orchestra. We were all enthralled with his ability on the violin, but in the end Bobby remained the Concert Master. David was not quite good enough. Wonder if part of his mental challenge was being good enough. Are any of us ever good enough? The freedom that David had to play his music and experience life are something I find interesting. He might not have been a complete friend in the Aristotle definition, but he was free and he lived life his own unique way. Ike, thanks so much for your insights and your excellent questions that challenge us to think about ourselves. David certainly did live life his own unique way. I’m grateful that I am your friend. When David was in the sixth grade, he was riding his bicycle to Midwood School and was run over by a car. The fact that his violin in its case was on top of David, and just beneath the underside of the car, saved his life. How prophetic and metaphorical that David’s violin continued to literally save his life through to the end, as it was always “the tie that binds our hearts in Christian love.” Again and again, it provided his unique way to reach out to people and draw them into his inner circle – and nobody was ever not in David’s inner circle. There was no outer circle when it came to David. Whenever I hear his music, to this day, it brings me to tears. I still can’t listen to it without dissolving. After he died, I literally lost my voice and had to go to speech therapy. He is greatly missed. Being David’s sister was a real adventure. Thanks you, Norris, for sharing the journey. Carson, thank you so much for this engaging story and new insights into David. And thank you for sharing about your feelings about David. He is indeed greatly missed. Thanks for part 2 of a 3-part series on friendship. Since I’ve always wanted to be a student in one of your classes, your ongoing blogs give me great insight into what I already knew and have heard from countless students. You are an incredible teacher and translator of ideas. In talking about your friendship with David, you are also teaching us about what it means to be engaged in a friendship. You begin with Aristotle, but take us to the limits of his definitions of friendship, in attempting to reconcile what happens when “complete friendship” may not be possible. I’m looking forward to part 3! Aristotle sets the bar very high – impossibly so – when it comes to “complete friendships,” and yet I was reminded this past weekend of how “complete” friendships can be even when the people are not perfect. I spent time with a life-long friend, also named David, who lives in another part of the state and who I rarely see because of the miles. He was back home for his mother’s funeral. She died at age 99 – a long life that was well lived and ended peacefully. A good part of our conversation was about his experience of holding his mother’s hand as she took her last breaths. “Conversation” may not seem like the right word because during that part of our visit, he talked and I listened. But, since “conversation” involves both, I guess that is a good word for it after all. Like David McKnight, my friend David is an artist – a potter. He is also a paramedic and a teacher of paramedics. Most of all, he is a trusted, life-long friend and there is a strong bond between us. We can be apart for a few years and then when we get back together, it is like we have never been apart. We visit about experiences and dreams and trials and – well – life. But not just life on the surface. Our conversations go much deeper than that, and they can go deeper because of the level of trust between us. And care. Thanks so much for sharing these interesting insights about your own friend named David. It’s wonderful that you have such a lifelong friend. And your thoughts about “complete friendship” have set me thinking; thanks for that. Death: Out of Sight, or Front and Center?